Sun Cream Products Explained - BrightNewMe is a clinic based in Altrincham offering non-surgical cosmetic procedures and anti-wrinkle treatment for both men and women. Most dermatologists advise that the best anti-ageing product you can buy is a good quality suncream. But which one? You may not realise it but over the counter products rarely cover the full spectrum of the sun’s rays. The sun emits different types of harmful rays, predominantly Ultraviolet A and B (UVA and UVB). 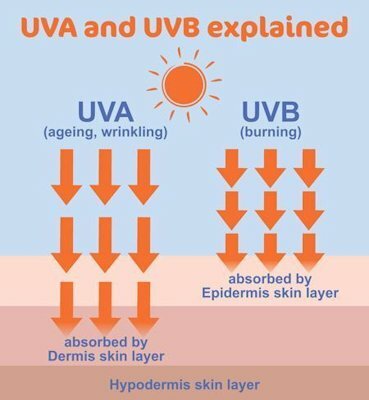 UVB is responsible for burning the upper/outer layers of the skin, whereas UVA penetrates more deeply, and is responsible for causing acceleration of ageing of the skin. The sun also emits Infra-Red (IR) rays which can damage collagen. Furthermore we get skin damage from HEV (High Energy Visible Light) which is generated by artificial light sources such as computers, mobile phones, fluorescent lights, and LED sources. So, how do you know what your sun cream protects against? 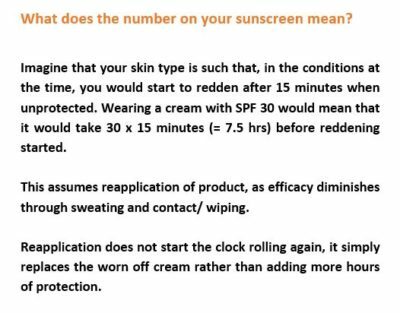 The SPF number is a guidance only to the level of UVB protection a cream offers, and correlates to the time you can spend in the sun without burning. Most doctors would recommend SPF 30 or more. If you would like to find out what this number means in practical terms, see the box on the left. Since this SPF value (e.g. 30, 50 etc.) only covers the UVB protection, and not the UVA, you need to ensure that your products are ‘broad-spectrum’ to protect against ageing UVA rays. It’s a myth that your moisturiser or foundation which just has a number will provide adequate sun protection. Unless it actually specifies that it provides broad spectrum cover, you won’t be getting any protection at all from UVA. Furthermore research shows that you would have to wear 7 times the amount of foundation or moisturiser than the average person uses, in order to get the UVB coverage stated. Another myth is that suncream is only needed in the summer. Whilst UVB burning rays are at their highest between April and October and between 10am and 4pm, UVA rays are present all year round. UVA also passes through clouds and glass. You’re at risk of wrinkles, pigmentation and even skin cancer even indoors on a cloudy December day. 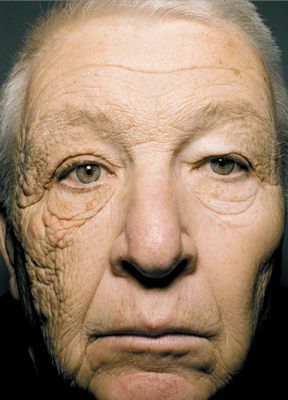 This 69 year old lorry driver has marked ageing on one side of his face as a result of UVA rays penetrating his side window. Medical grade suncreams have been more rigorously tested than over-the-counter ones, and are therefore much more reliable. Advanced medical grade suncreams also protect against HEV and IR-A. We stock 5 medical grade sun protection products at BrightNewMe. We have 4 sun screens from the ZO range. These ZO products offer excellent protection against all the above (UVA, UVB, HEV and IR) and are also unique in that they also contain fractionated melanin: natural photo-protective compounds and free radical quenchers. The tinted ZO Oclipse Sunscreen and Primer SPF 30 is very popular with female patients who find that the colour contained within the cream gives them a nice radiant glow, and it works as a great primer under make-up too. As it is a physical suncream it won’t irritate rosacea or sensitive skins. The ZO Oclipse Smart Tone SPF 50 which has a sheer tint and is designed to match any skin colour and tone. The ZO Daily Sheer SPF 50 is similar to the Smart Tone above, without any colour, and is popular with male patients or ladies who prefer no tint. The ZO Broad Spectrum SPF 50 is a physical (mineral) suncream – so good for sensitive skins- and also has no tint. 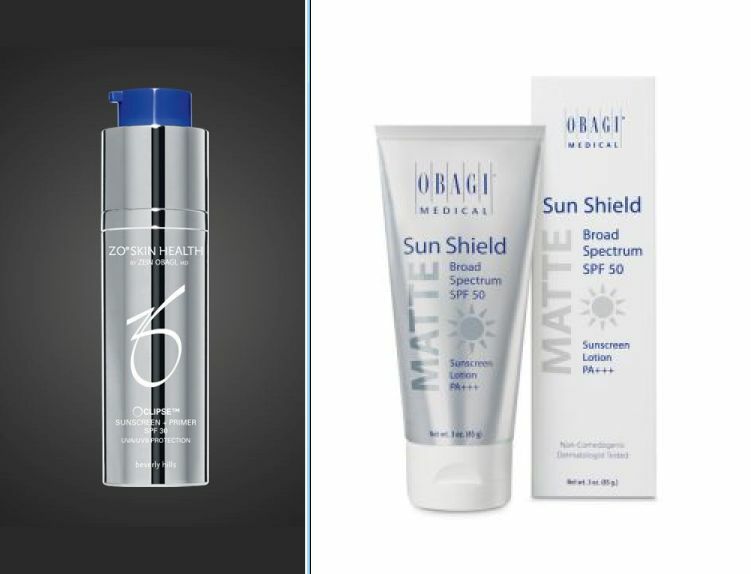 The Obagi Sun Shield SPF 50 is broad spectrum, with a high rating for UVA protection. This Obagi product has a matte appearance, with no tint, and so is also suitable for men. We have sample pots of any these products available, and existing patients are welcome to pop in and ask to try any of them. I am proud to say that my views on sun protection were recently sought by Aesthetics Journal, a publication for aesthetic practitioners. I’m always keen on patient education so do take a look at this article if you’d like to know more – it lists some very helpful tips from NICE, The National Institute for Health and Care Excellence.